"I don't suppose you just want a fourth for bridge?" The comic beings by concluding the Ice Warrior story from last issue, ending with Frobisher leaving and Olla taking his place. She leaves in the second story as a Federation enforcer comes for her. The final story has the Doctor running into Death’s Head, thus completing my pain. OK, so Furman’s interest in multiple storylines isn’t in view here, but a lot of my complaints are personal ones. For example the appearance of Death’s Head. For those not in the know, Death’s Head was a character Marvel UK created for their Transformers comics but introduced in an unrelated comic so they wouldn’t give up the rights to Hasbro. This story explains why DH is normal human sized instead of Transformer sized. However, now we have to believe that the Transformers and the Time Lords exist in the same universe. While these may be my first two favorite fictions, I don’t see how that’s supposed to work. I barely accept Transformers and G.I. Joe co-existing in the comics. Personally I never liked the character of Death’s Head, so that’s a personal foul against it. And the “Time Warden”? What was the point of that character? He offers nothing except a lame joke. In the other two stories, Furman decides to dispatch with Frobisher and at the same time acknowledging Peri and ignoring Mel, but I got into that last issue. Then we get a new companion for all of one story, and she turns out to be evil. Why bother? That said, Furman does do a good job of writing the 7th Doctor and with the help of good art (which changes artists from story to story–these are mostly one-shots, folks–I can hear Sylvester McCoy as the Doctor, so it’s not all bad. I voted “burn it” over at ComiXology, but it could be more for personal complaints than the comic being bad. You’ll have to decide for yourself, but I’m not comfortable with Furman on another of my favs. I’m serious, please keep him off of Godzilla. 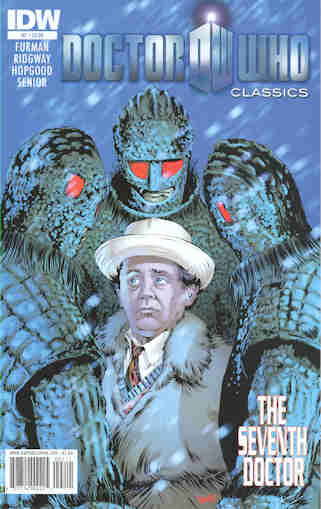 Posted by ShadowWing Tronix on March 7, 2011 in Television Spotlight, Today's Comic and tagged Doctor Who, Ice Warrior, IDW Publishing, Seventh Doctor, Simon Furman, Sylvester McCoy.